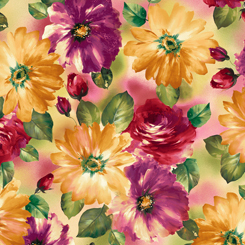 Boldly beautiful florals are blooming in this new collection from QT. Paisley prints paired with mini roses and textural allovers in lush colors are calling for a dynamic project to be born. Enjoy mixing and matching to your heart's delight with so many lovely colors and prints.